Strikers, occupiers, don’t wait for union leaders! G20 summit: whose fightback starts here? Download pdf (see "attachment"). 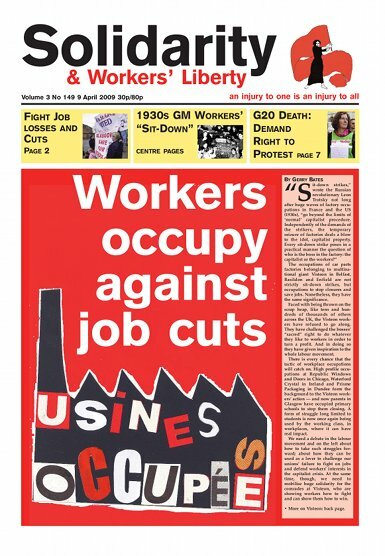 Solidarity 3/149 is eight pages, rather than the usual 20, because we have gone to press early in order to be able to get the paper distributed before the Easter holidays. Just as the boards were going up on the first of eleven libraries due to be axed by Wirral Council, we were told that the closures would be halted pending a Government enquiry. This enquiry has come directly as a result of the campaigning that has taken place across the Wirral and is, despite problems will we face in the future, a big step forward. As council cuts begin to be made across the country, it is important activists pool information about what we are doing locally. The occupation by parents of the Wyndford Primary School and St. Gregory’s Primary School in Glasgow which began on Friday 3 April is part of a Glasgow-wide campaign (Save Our Schools) triggered by proposals for a city-wide cull of primary schools and nurseries. In January a meeting of the Glasgow City Council Executive Committee agreed in principle to shut down 13 primary schools and 12 nurseries, attended in total by more than 2,000 children. Later a full meeting of the City Council endorsed the proposals. As we go to press workers on London Underground are balloting over strike action to defend job cuts and pay. London Underground is cutting more than a thousand jobs in administration grades. Transport for London is due to cut around three and a half thousand jobs over the next eighteen months. At the same time London Underground have made an offer of a five-year pay deal — RPI plus one percent in the first year and then RPI only for the next four years. That is an effective pay cut. In the four years from July 1970, British capitalism “lost” more than five million working days to combined industrial action against a new Industrial Relations Act and government incomes policy. On Wednesday 1 April thousands of anti-G20 demonstrators protesters converged on the City of London in a series of protests which aimed to highlight capitalist responsibility for climate change, environmental destruction, poverty and war. The press and police had been warning of the possibility of “extreme violence” especially from the demonstration destined for the Bank of England and the police had promised to meet any law-breaking with great ruthlessness. How did 19 March compare to the day of action on 29 January? The demonstrations were bigger than those of 29 January: between 2 and 2.5 million demonstrators on 29 January, at least 3 million demonstrators on 19 March. All the observers agree that it was not exactly the same people marching this time. More workers from the private sector joined the demos — the effects of the crisis: plant closures, sackings everywhere. Throughout the twentieth century there were periods of class struggle that saw workers occupy factories and workplaces: in the 1920s in Italy; in the 1930s in France, the USA and elsewhere; in France in May 1968. And in Britain in 1973-75 there were over 100 occupations over job cuts. The following account by Walter Linder tells the story of how the tactic — called a “sit-down strike” in the US — was used at General Motors car plants at Flint, Michigan, in 1936-37.